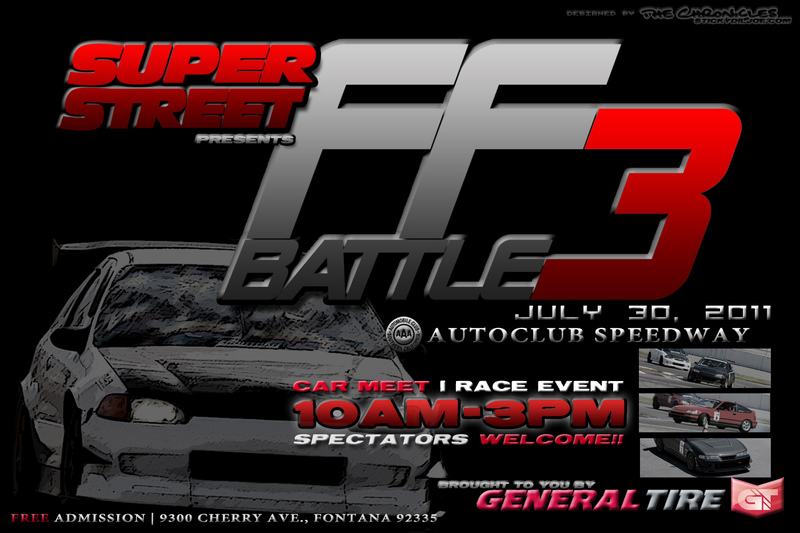 Before I go, I’ve attached the flyer to the 2011 FF Battle event with some details about the event. If you could do me a favor, please post this up on your favorite social networking sites, on your favorites forums, etc. and spread the word about the event. The competition-side of it is always cool but we are trying to get this meet to be bigger and better than ever, with more attendance from enthusiasts and the general public. Tell your friends, your family, your step-dad, whoever…help The Chronicles spread the word about the event. I’ve attached a link to the original flyer in a larger format so if you’re going to hotlink the image, link the larger one please. Thank you and see you guys out there for the 2011 FF Battle!! I don’t feel the cars that are invited are a good representation of fast Hondas with most of the cars represented being west coast vehicles. I really wish you guys would invite some East Coast guys such as Chad Slagg or Kevin Helms. Although their cars aren’t street legal cars they are some of the fastest Honda Challenge racers and I know they would post fast times. Maybe that is something that can be worked on for next year. I understand what you’re saying. You have to realize that there is no rule within the FF Battle competition that limits the cars from only being from the West Coast. It was an open invite process and anybody that wanted to participate was free to submit their information for the approval process. This year’s competition actually features a Honda that’s all the way from Canada so to say that it’s only West Coast Hondas is very misleading. There wasn’t a select invite process because there was never a condition preventing anyone else from participating. Also, the Hondas have to be at least somewhat streetable vehicles, and not complete, full-on race cars. If it’s a Honda Challenge participant, than they wouldn’t really be able to compete against this group of Hondas anyway, because this is meant for streetable FF Hondas. Thanks for posting this though because I believe that there are others out there who are also not aware of this. They need to build street legal cars and they will get invited. Who do I have to contact in order to attend the event on the 30th? If you want to participate in the event, unfortunately, all spots have been filled already for the competition. If you want to just come out and spectate the event, then it’s free to everyone.